Whether you are a Do-It-Yourself'er or want Harmony Farm Supply to design a Rainwater Harvesting System for you, it is always helpful to understand the fundamentals of any project. 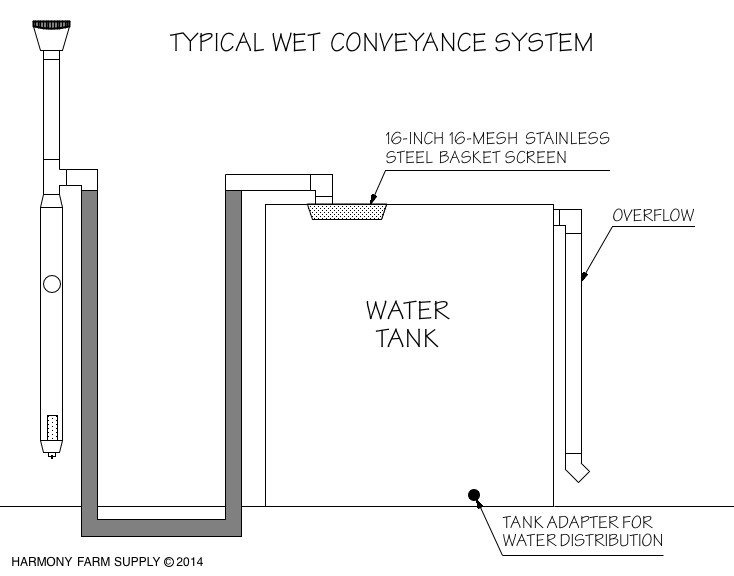 The following is a simple description of the basics of Rainwater Harvesting. For a listing of the materials and supplies that we provide to support a project, just click this link: Rainwater Harvesting components. Leading “watchdog” organizations around the world have reported major concerns regarding the present and future availability of surface and ground water supplies. U.S. federal planners have recently determined that the United States will not be able to meet future water demands unless conservation alternatives are implemented. Rainwater Harvesting or Rain Catchment is one alternative that has been growing in popularity. Even the National Oceanic and Atmospheric Administration has undertaken a program to fund rainwater harvesting projects around the country as a means to store water at the individual property-owner level. Rainwater harvesting involves capturing rainwater before it reaches the aquifer—usually from roof gutters—and storing that water for future use, typically for irrigation and/or livestock watering during dry periods. The rainwater is often stored in tanks (above ground or below ground), a pond, or a cistern. For purposes of explaining the functions of a Rainwater Harvesting system, this description will employ water storage tanks. Collecting rainwater offers many advantages in addition to water conservation. Some of these are energy conservation, reduced run-off (which helps prevent flooding and erosion), reduced demand on groundwater sources, decreased water contamination due to leaching, and of course decreased water bills. Rainwater that is stored is usually used only for irrigation purposes. Because it can sit for days or weeks in the storage tank, the water can become stagnant (causing bacterial growth), so the water would require treatment if it is to be used for domestic purposes, i.e., potable drinking water. It is quite possible to do this although it would add complexity and expense to the system. 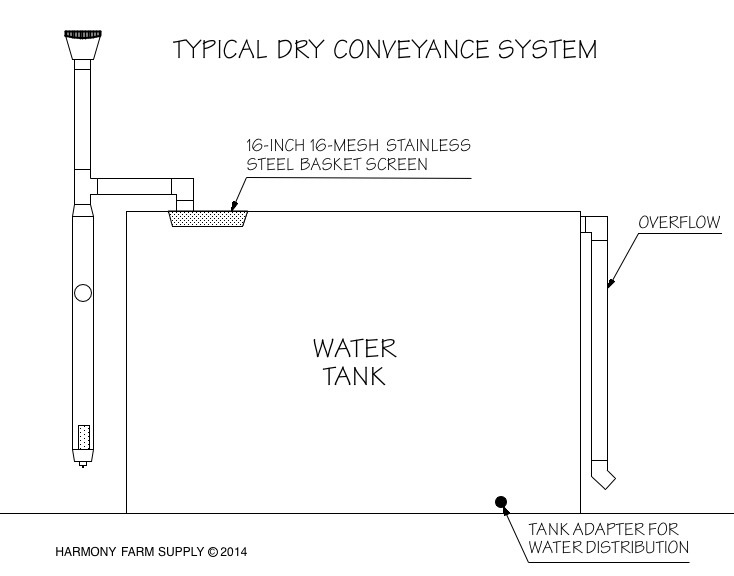 Rainwater harvesting systems are generally split into 2 basic types of conveyance systems: dry conveyance and wet conveyance. The key to either system is the collection of “clean” rainwater. During a rainfall period, debris from the collection surface (i.e., a roof) can be washed into the gutter or collection device and, if not filtered out, the debris will make its way into the storage tank. Several methods have been developed to remove this debris from the rainwater. 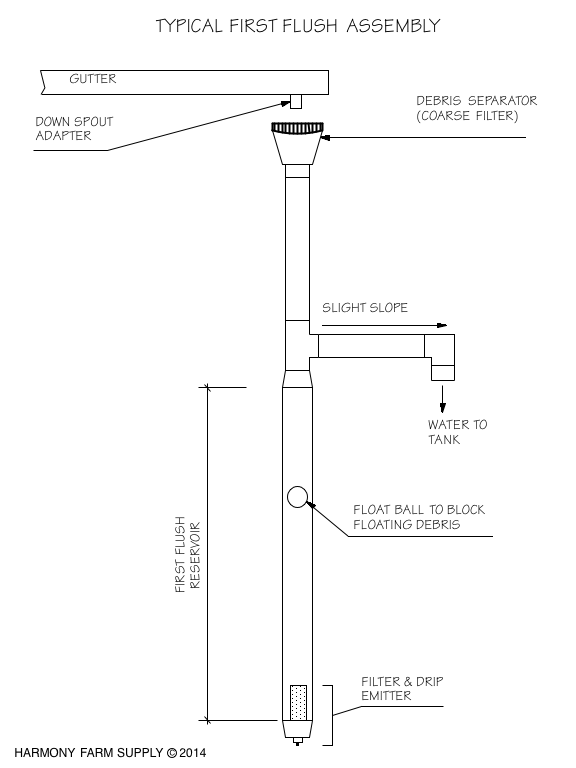 Most commonly used is a debris separator that is placed on the gutter or just below the downspout (see DIAGRAM 3). The debris separator is a screen that will restrict the largest items (like sticks and leaves) from entering the system. One disadvantage of a debris separator is that it is often located at the roof level, so climbing a ladder is often required to perform the necessary periodic clearing of accumulated debris on the screen. If the debris separator is not periodically cleared, the debris could inhibit water making its way into the collector. The initial runoff from a roof will be the most contaminated (i.e. dirt, debris, bird droppings). A “first flush” diverter mechanism should be installed to divert the dirtiest first gallons of water into a by-pass reservoir that will prevent conveyance of that particular water into your rainwater storage tank. First flush diverting mechanisms come in many shapes and sizes. A section of 4” diameter PVC pipe is recommended as a diversion reservoir with a “tee” at the top through which the cleaner water will flow. The length will depend on the size of the roof and the available space below the “tee”, i.e. the larger the roof, the larger the first flush reservoir. A float ball is often employed in the first-flush device. Some of the debris will float, so as the ball moves up the device, it eventually blocks the opening of the first-flush thus capturing the floating debris below. At the bottom of the first-flush reservoir are a water filter and an irrigation drip emitter. This allows the reservoir to slowly drain such that it is emptied before the next rain. (See DIAGRAM 3.) Because the water may contain harmful bacteria (e.g., salmonella), it is best to let it drain onto gravel or drain-rock. In addition to ensuring that relatively clean water arrives at the storage tank(s), it is equally important to prevent other contaminants and “vectors”—such as bugs and other critters—from accessing the tank(s). Inlets, overflows, and vents on the storage tank(s) should be protected with a 16-mesh (or finer) screen. The 16-mesh (which has 1/16-inch holes) keeps mosquitoes and other undesirables out of the stored water. Some tanks, like the Bushman line of rainwater harvesting tanks, come equipped with a 16” diameter 16-mesh stainless steel basket screen at the inlet and a 3” 16-mesh stainless steel screen on the overflow. These screens do require periodic maintenance as some debris will find its way into the tank and collect on the screens. For small systems, the stored water can be used to fill a watering can from a spigot at the bottom of the tank, or a small sump pump can be installed inside the tank that can be connected to an irrigation system or hose. For larger systems of 5,000 gallons or more, a conventional pumping system is generally installed to accommodate a larger irrigation system. Now that the concepts and principles are understood, it’s time to develop a plan. As mentioned above, the first consideration is a water budget (i.e., how much water will be required). This will determine the optimum size of the storage tank or other storage medium. One approach is to evaluate the historical use by calculating the amount of water used during the previous year assuming that usage will not dramatically change. The other approach is to project upcoming or future requirements based on a plan. There are numerous websites that provide information on weekly water requirements by specific plants. Or perhaps what is important is to store “some” water for purely for conservation’s sake. Once the amount of water is determined then the size, shape, and space requirements can be evaluated for feasibility. Then of course, an estimate of the cost can be calculated and a budget can be created. If help or information is needed, Harmony Farm Supply’s trained professionals will be happy to assist. Harmony Farm Supply stocks a variety of tanks in different shapes and sizes, in addition to the necessary equipment to implement the optimum Rainwater Harvesting system. U.S. Weather Bureau Technical Paper No. 40. Chart 14: 100-Year 60-Minute Rainfall.